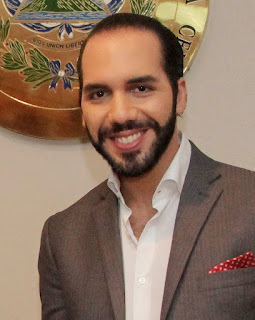 Today is the last day of Nayib Bukele's time as mayor of El Salvador's capital city. The mayor came into office as a candidate of the FMLN, was kicked out of his party, and remains the most popular politician in El Salvador. He finished his time in office in full campaign mode to run for president in 2019. Bukele focused his administration as mayor on renovation of the historic center of San Salvador. Unlike prior mayors, he was able to accomplish this without a single riot of the informal vendors who clog the downtown streets. He delivered on public services like trash collection and fixing potholes (although my car still finds plenty of holes in the streets). Everything had his trademark shade of blue, from the new garbage trucks to the municipal signs. Bukele's time in office earned him glowing reviews in the international press, with articles in TIME magazine, Virginia Quarterly Review, Forbes, and The Economist. A series of headlines from El Salvador this week. No changes to El Salvador's total ban on abortion. The possibility of changes to El Salvador's total ban on abortion faded as the current National Assembly closed without taking up a reform bill. The new legislature will be more conservative and unlikely to make changes. Nayib Bukele supporters sign petitions to form party. Very large crowds of supporters of San Salvador mayor Nayib Bukele turned out to sign petitions to register his movement "Nuevas Ideas" as an official political party in the country. Bukele hopes to run for president in 2019. Husband of slain journalist arrested. Authorities arrested the husband of slain journalist Karla Turcios this week. The focus turned from this being a case of an attack on journalism to a case of femicide and domestic violence. A real estate developer in El Salvador has spent almost nine months bulldozing and erecting houses on top of an important archaeological site in the department of Sonsonate. The builder ignored multiple orders by government authorities to stop its work, and the construction ceased only two weeks ago when a court order was finally being enforced. The US State Department released its annual human rights reports for the countries of the world this week. The 2017 report for El Salvador can be found here. Judge orders reopening of Jesuit massacre case. A judge has ruled that a criminal case in an El Salvador court should proceed to determine criminal responsibility for those who ordered the 1989 killing of six Jesuit priests, their housekeeper and her daughter. The country's attorney general must now file new charges in a case which will involve former president Alfredo Cristiani and the military high command from 1989. "Dollarization" won't be reversed. The Constitutional Chamber of El Salvador's Supreme Court rejected a petition to overthrow the country's 2001 conversion of its national currency from the colón to the US dollar. The abandonment of El Salvador's own currency seventeen years ago continues to be unpopular among much of the population. Legal proceedings to assess the criminal responsibility of the intellectual authors of the 1989 assassinations of six Jesuit priests, their housekeeper and her daughter in El Salvador, have gotten a tentative start. 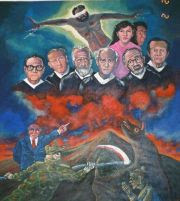 In November 2017, the Human Rights Institute of the University of Central America (IDHUCA) petitioned a Salvadoran court to reopen the case and investigation into the Jesuit case. The petition was made possible by the 2016 nullification of an amnesty law which had protected the defendants from possible prosecution in El Salvador. The case seeks to hold responsible senior military commanders for ordering the massacre.